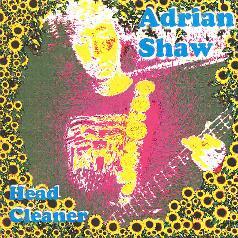 Adrian Shaw - "Head Cleaner"
Hawkwinder, Fronder, and solo artist Adrian Shaw's newest release is a collection of songs that really grabbed me from the first listen. I'm not sure what it is. There's nothing particularly amazing here. Just a great collection of tunes with 'stick in your head' melodies, great acid psych, and strong guest contributions. Head Cleaner opens with a bang as Simon House contributes cosmic freakout solo violin to "Symbiosis", and finishes on a dreamier note with Simon playing a psychedelic lullaby solo. "Mobius Trip" is a valium-paced psych tune with short but wonderful moments of echoed stratosphere guitar. "Staring At The Sun" is a total acid psych tune with great guitar by Bari Watts and a riff that sounds quite close to "Pictures Of Matchstick Men". On the more straight rockin' side is "Round And Round" which is what ZZ Top might sound like if they were a head band. And "Drowning" is a raw heavy bluesy psych rocker 'a la Hendrix. "What Else", "Tattered Butterfly", and "All In The Mind" all have a Beatles feel to them with more mind-melting guitar by Watts on Butterfly and nice tasteful guitar from Nick Saloman on All In The Mind. In summary, this is a solid collection of tunes that are strong both in the song and instrumental department. Adrian's sense of melody adds real weight to the instrumental moments which are totally cosmic but kept within the confines of song structures. For more information you can visit the Woronzow Records web site.